Our Nutrition Coordinator Michele continues to wow our clients with recipe ideas and tastings that don’t tax your budget. Last week Michele whipped up a batch of Banana Nut Snack Bread that was moist, nutty and easy to make. 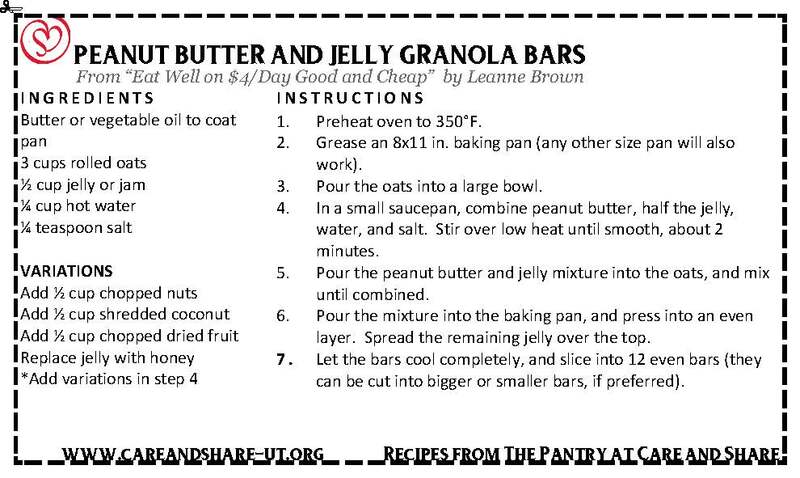 This Thursday we are looking forward to Peanut Butter and Jelly Granola Bars. We know Michele won’t let us down and we are crossing our fingers for leftovers. Swing by The Pantry at Care and Share on Thursday, April 20 and have a sample. The tasting begins around 9:00 a.m. and Michele is sweet enough to hang out until the samples are gone.